I’m trying to use Omnia and specially its SFP port to replace the ONT / router from my provider - Orange France. There it seems to boil down to “call Your operator and make them disable auto-negotiation on their side”. Has there been any news so far since the Fiber7 thread has died down (~February 2017)? Updates to the drivers, etc. Aparently the sfpswitch.py has a “force_mode” that allows it to set no_negotioation on the Omnia side. Does this help anything? Where is this mode set? Can I run the script manually, without breaking anything? PPS All the other symptoms on my side seem to be equal to the others, save for one thing : my adapter doesn’t seem to have any I2C. 2017-03-18T00:32:30+01:00 err sfpswitch.py: Switching NIC mode to phy-sfp. 2017-03-18T00:32:59+01:00 err sfpswitch.py: Switching NIC mode to phy-sfp. 2017-03-18T00:33:00+01:00 err sfpswitch.py: Switching NIC mode to phy-sfp. 2017-03-18T00:33:01+01:00 err sfpswitch.py: Switching NIC mode to phy-def. 2017-03-18T00:33:02+01:00 err sfpswitch.py: Switching NIC mode to phy-def. 2017-03-18T00:33:03+01:00 err sfpswitch.py: Switching NIC mode to phy-sfp. 2017-03-18T00:33:32+01:00 err sfpswitch.py: Switching NIC mode to phy-sfp. 2017-03-18T00:33:33+01:00 err sfpswitch.py: Switching NIC mode to phy-sfp. 2017-03-18T00:33:35+01:00 err sfpswitch.py: Switching NIC mode to phy-sfp. 2017-03-18T00:33:36+01:00 err sfpswitch.py: Switching NIC mode to phy-sfp. 2017-03-18T00:34:05+01:00 err sfpswitch.py: Switching NIC mode to phy-sfp. 2017-03-18T00:34:05+01:00 err sfpswitch.py: Switching NIC mode to phy-def. 2017-03-18T00:34:06+01:00 err sfpswitch.py: Switching NIC mode to phy-def. 2017-03-18T00:34:07+01:00 err sfpswitch.py: Switching NIC mode to phy-sfp. 2017-03-18T00:34:09+01:00 err sfpswitch.py: Switching NIC mode to phy-sfp. This is a very different technology. GPON as such is not a technical problem, but we need cooperation during this change providers. To get an idea about the technology and the difference will be links. hi, i dump the eeprom of SFP ONT orange france, can you tell me if it’s possible to do compatibility with omnia? 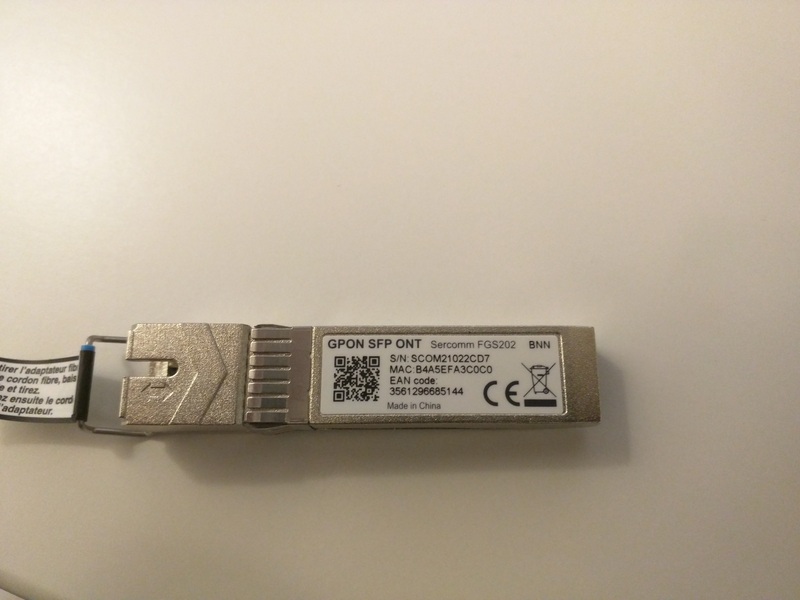 i dump with minipro a Sercomm SFP ONT FGS202 flash/eeprom MX25L6435E.